War has always been about two things: resources and control. Alongside the supposed surprise discovery of Afghanistan's $1 trillion wealth of untapped minerals, it's more than coincidental that before the US invasion, the Taliban along with the UN had successfully eradicated the opium crop in the Golden Crescent. Now 90% of the world's heroin comes from Afghanistan. Heroin is a multibillion dollar business supported by powerful interests, which requires a steady and secure commodity flow. One of the "hidden" objectives of the war was precisely to restore the CIA sponsored drug trade to its historical levels and exert direct control over the drug routes. In 2001, under the Taliban opiate production stood at 185 tons, increasing to 3400 tons in 2002 under the US sponsored puppet regime of President Hamid Karzai. While highlighting Karzai's patriotic struggle against the Taliban, the media fails to mention that Karzai collaborated with the Taliban. He had also been on the payroll of a major US oil company, UNOCAL. In fact, since the mid-1990s, Hamid Karzai had acted as a consultant and lobbyist for UNOCAL in negotiations with the Taliban. In today's globalized world, one can't discount the role that multinational corporations play in US foreign policy decisions. 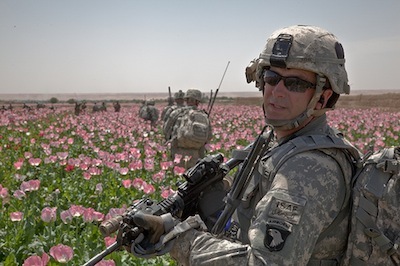 Not only have oil companies and private military contractors made a killing off the Afghanistan occupation: big pharmaceutical companies, who collectively lobby over $250 million to Congress annually, need opium latex to manufacture drugs for this pill happy nation. Last year marked the ninth anniversary, not tenth. Abby on Fri, 08/26/2011 - 11:59pm. Michael Fury on Sat, 08/27/2011 - 10:55am. When General Petraeus spoke at Brigham Young University about a year ago, my wife and I went to hear him. One student had the temerity to ask - after nearly 9 years in Afghanistan, why had not the US military wiped out the opium fields? given the US' "war on drugs" and all. Petraeus smiled, then answered that they were "looking for a cash crop" to replace the opium, and when they found it, the opium would be gone. Strong analysis, Abby -- thank you. ProfJones on Sun, 08/28/2011 - 6:19pm. Thanks for the feedback Dr. Jones! Abby on Mon, 09/19/2011 - 12:50am.